Looking down from our hotel perch the cranes seem to have stretched their heads to the horizon and lifted the sun on a hook. Their steel necks are bathed in gold as they hover above the channel. These poised, mechanical dinosaurs color the city in an almost prehistoric light, as though at any moment they could come to life and wade through glittering waters. Instead they turn only back and forth, back and forth. Picking up and dropping down. Is this industrial rhythm what calls the city to wake? I see the bus, the storefront clerks, children in the schoolyard, all trickle out to work or play. From this height one would think us removed from the tempo of their routine. But there is something about this place that leaves us restless and at ease in a single breath. Before we know it, our packs are on and we begin our descent- each footstep into the landscape propels us further into her mystery. We wait on a bench for the ferry with our bikes perched next to us. Everyone else is standing with their own, holding them as if extensions of their limbs. The ferry steadily makes her way back to the loading dock as she has done the past several hours. She carries with her young and old, suits and skirts. When she docks, kickstands go up in one fluid motion, almost choreographed, and the line proceeds forward. We follow clumsily behind, trying to bring our own bikes into order. Without any ceremony or announcement we are crossing the channel and moving beneath the towering crane-guardians. Today is Monday but there is nothing apparently manic about it here. There are no blaring horns at lunch hour, or sterile coffee houses. It is the same steady pace of beauty and work that was present yesterday. The streets are filled and the clock hands turn and the bike wheels propel, but the city isn’t all gears and go. There are hats and umbrellas and lace and linen. I cannot say for certain but I wonder if there is perhaps an unspoken regard on the importance of being beautiful and excellent? The ferry has docked. We get ready to exit and wheel our bikes onto land. A stranger hands me a Mikan. It is cool on my sweating palms and the most brilliant color green. In this gesture something remarkable takes place but I know not what. A white cat sits on the beach below and smiles with her eyes. We push our bikes and venture to see where our feet will take us now. As I step off the dock and place the Mikan in my pack, I can’t shake the feeling that I am stepping out of church. The crane-giants are sleeping and the ferry is still. It is the fishing boats that have my attention now. They are long and wooden and full of shadows. Their helms are empty…but are we sure? The waves cause them to thrash and bob like the very fish on their lines earlier that day. Nets hang draped off the boughs like giant, sea-soaked cobwebs. We look over the edge of the rock wall on which we sit and I feel as though I have glimpsed yet another hidden dimension. Was that the lights from the dock? Or a face? I am glad for this perch above such inky waters. A large wave crashes on the rocks below. The spray leaps up and grabs at my ankles. Even now the city secrets beckon traveling feet to venture deeper. The call is so strong that I might have slipped and journeyed even more were it not for the moon rising, drawing with it a silver curtain across the entire scene. It is time to rest. I lay in bed and sleep covers my body like a blanket-first pulling over my toes, then my stomach and to my neck. Each weary muscle from our travel sinks into the mattress. Through the open window, the only sound I hear is the breeze rustling through bamboo forests. 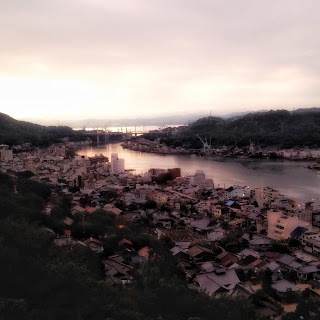 In the second before sleep takes over, the thought crosses my mind that maybe Onomichi is not a puzzle to be solved, but rather a fairytale to be lived-a sort of dream come to life in which I was lucky enough to journey through. Either way, dream or reality, the cranes are hovering at their post and waiting for tomorrow’s dawn. Waiting once more, to pull up the sun.